Something exciting came in the post today. 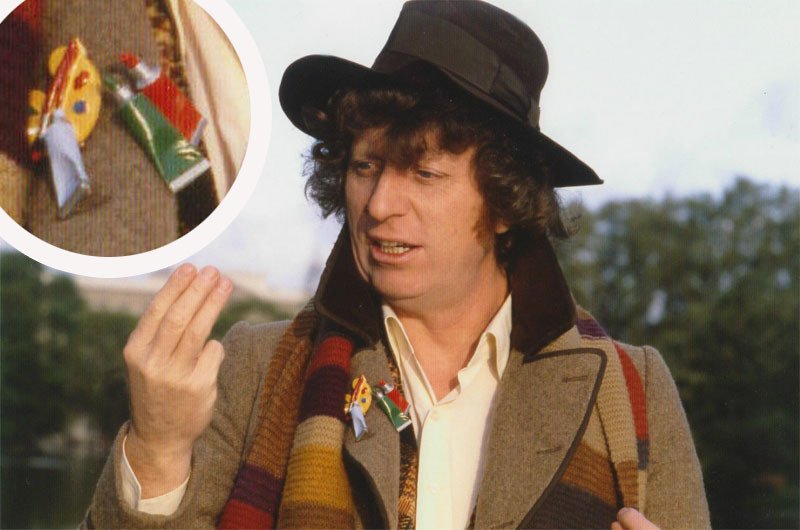 After making my City Of Death style frock coat, I’ve been after a really good replica of the Artist’s Palette brooch worn in the episode. I had seen a few replicas around, but none had grabbed my attention. 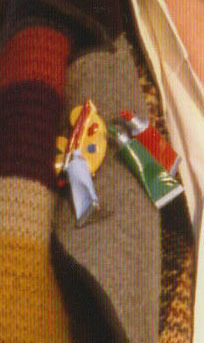 The paint tubes of the brooch have a very distinctive angle to them, with the red and the green close together and the blue off doing its own thing. No-one had quite captured this for me. Then something occurred to me. 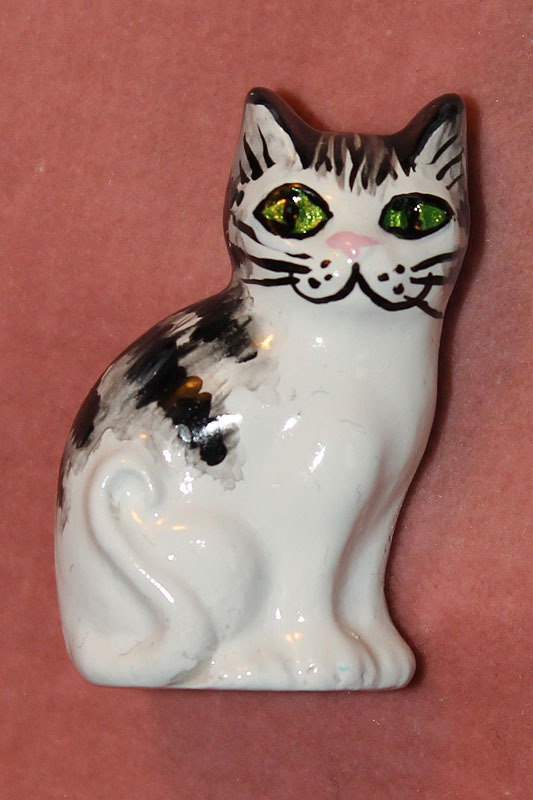 If you follow my Sixth Doctor costume blog you’ll see I have a special arrangement with Susan Trevor, who made THE ceramic cat brooch proudly worn by Colin Baker. She makes replicas for me, using her original mould and hand paints them just like the real thing she did over thirty years ago. 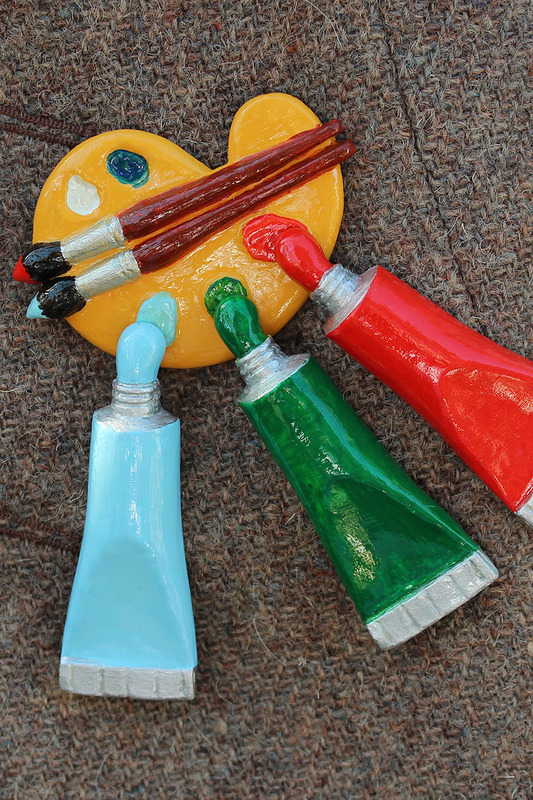 I put the idea of the palette brooch to her and she declined, saying that casting the brooch with the paint tubes attached would be enormously difficult, with a danger they would snap off even before it was even painted. But then I came across a very revealing photo which changes everything. 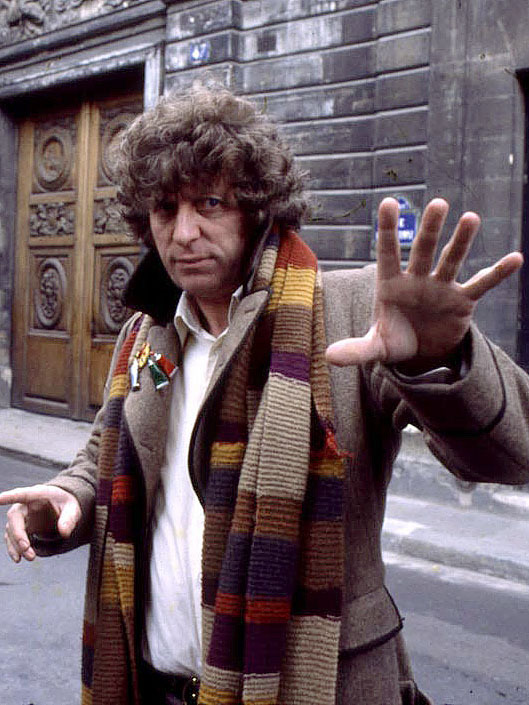 It’s an unusual shot of Tom on location. Not one I had seen before. But then the brooch caught my eye. If you look closely you can see the red and green tubes are at a very odd angle. 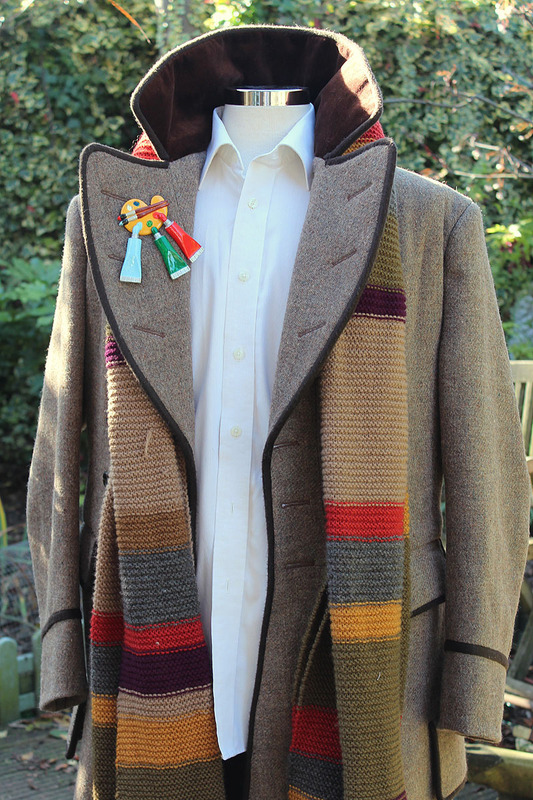 They are almost going around the lapel - in fact you can clearly see the red tube isn’t even attached to the palette. 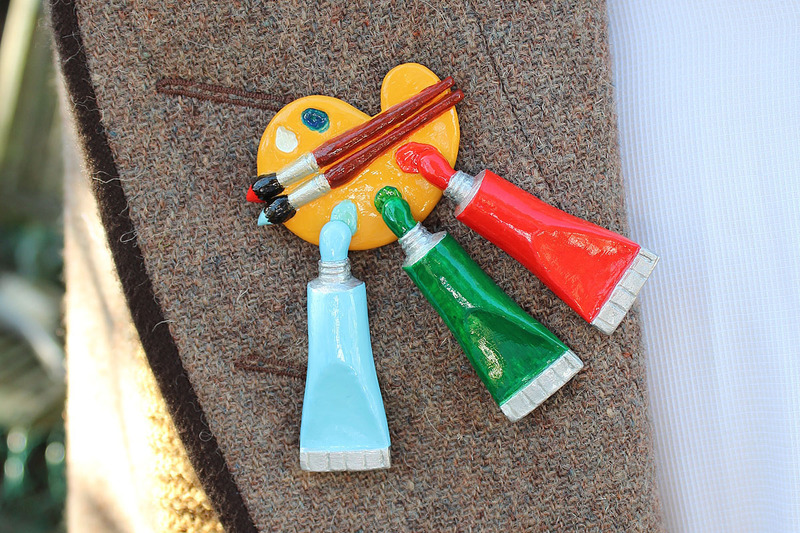 Then is dawned on me - this is not A brooch - it is a set of FOUR brooches! This explains the irregular spacing of the tubes - they are individually pinned on best as can be, but not equally spaced. Knowing this not only makes a whole lot more sense but means it is practical to make them. So today Susan’s first prototype arrived in the post - and I think it’s brilliant! She has really captured the look, shape and colours of the original - and looks fantastic on my coat! I’ll be taking orders for these brooch sets very soon, so drop me a line if you want to reserve yours now! 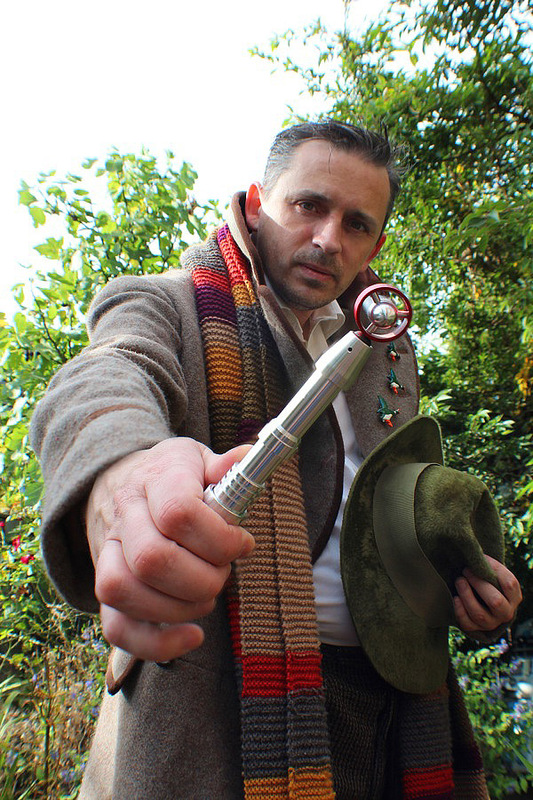 These look AMAZING, but I've been doing some personal cross-referencing and it seems a little too big... I've seen pics where your palette is positioned in the same place as Tom's, but the paint tubes on yours come down too far below the button hole. Your tubes maybe a little TOO long. The bottom of the blue tube on Tom's MEETS the button hole marking. The 'squeezed' section looks great, I think it's the full body section of the tubes that are too long. Could you please include some dimensions? Can you get these in different colours? I'd love to get tubes in the season 18 colour way of wine, purple and orange. Yes - what an interesting idea. There is no reason why it couldn't be done - though it would have to be paid for up front, and there would be a delay on delivery while Susie paints it to order. Get in touch if you want it done. City Of Death brooch - PRE-ORDERS NOW OPEN!